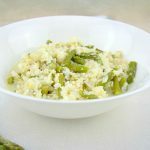 A grain free, low carb asparagus risotto made with cauliflower rice. Steam or boil the asparagus for 5 minutes until tender. Add the spring onion and gently saute for about 2 minutes until tender. Add the cauliflower rice and toss to coat in the oil. Add the vegetable stock, simmer on a gentle heat for about 10 minutes until tender. Add the asparagus, cream, lemon juice, lemon rind and Parmesan cheese, stir well and season with the salt and pepper. Cook for a further 2-3 minutes until the cheese has melted.